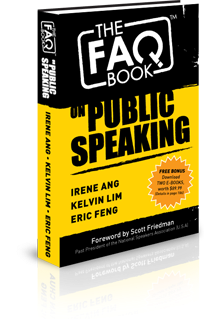 Check out the new FAQ Book on Public Speaking by Eric Feng, one of Singapore's top Toastmasters. His co-authors are Kelvin Lim, Asia Master Coach from the International Coach Federation (one of the most highly paid coaches in Singapore) and Irene Ang, celebrity and comedian who has won several TV awards both in Singapore and Malaysia. They've written a book with all your most pressing questions about public speaking in a convenient and accessible FAQ format. I've enjoyed reading Eric's blog, and the book employs the same conversational and friendly tone in answering your public speaking questions. AND, one of the bonuses when you buy the book is the first two sessions of my "7-Week Shortcut to Public Speaking Confidence" e-course! Such a deal! Other bonuses include articles by Patricia Fripp, award-winning speaker, executive speech coach, author, and past president of the National Speakers Association (and first female NSA president) - that's some good company, and her materials are excellent. The book is expected to be released on August 31, but you can download a draft chapter now.